Cracking can cause part failure, a short part life and be visually unacceptable. Cracks may not be obvious until several days or weeks after production. Hence, it is better to recognize and remove the potential problem of cracking before production. 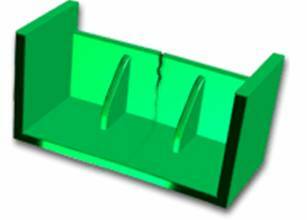 Moldflow Plastics Insight provides detailed shear stress results. Cracks may occur in regions where internal shear stresses are frozen into the part. Differential orientation, packing and cooling cause differential shrinkage resulting in high internal stress levels being frozen in.